Accompanied by the Court Jurors, members of the public and many distinguished guests, Henley’s Court Leet assembled for its Annual General Meeting in the Guild Hall on the evening of Wednesday 14th November 2007. Held each year at this time, this meeting is overseen by the Steward of the Manor of Henley-in-Arden, David Lodder, who summons the various officers of the Court to present their reports on the year’s activities. He also who conducts the process of electing officers for the coming year. Proceedings were opened by the Town Crier, Gordon Trinder. The Lord of the Manor, Mrs Robin Hardy Freed of Pennsylvania being absent, it fell to Honorary Burgess Derek Sharman to welcome those present on her behalf and to convey a message received from the Lord of the Manor. A tribute was paid, by Honorary Burgess Alec Halliwell, to a long standing Court officer, former High Bailiff and later Honorary Burgess Keith Ford, who passed away in October. Mr Ford had been active in every corner of Henley’s community life and would be sadly missed: Henley had lost “a gentleman”. 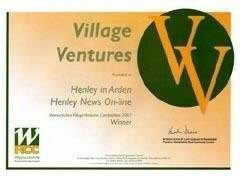 Among his announcement, the Steward complimented Henley resident and editor of Henley News On-Line Bill Leech on winning a County award under the Warwickshire Villages Ventures Competition 2007 for his outstanding on-line newspaper, now in its fourth year. 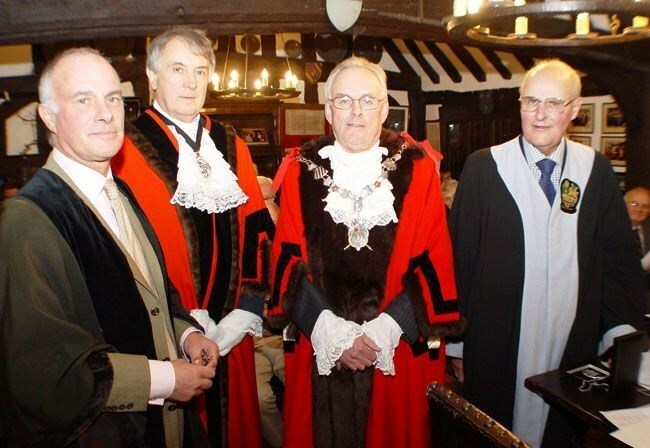 Front line from left: The Reeve of Bromsgrove, John Rogers; the Bailiff of Bromsgrove, Denis Norton, The Chair of Henley and Beaudesert Joint Parish Council, Cllr. Sheila Roy; The Chairman of Warwickshire County Council, Cllr. 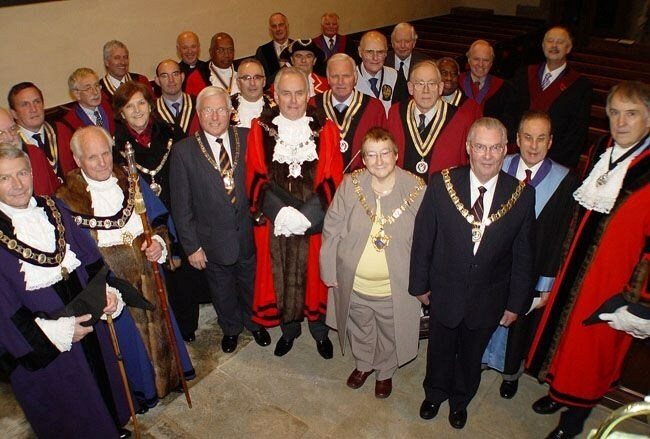 John Wells; (behind) The High Bailiff of Alcester, David Henderson; (further behind) The Low Bailiff of Alcester, Lennox Cumberbatch; (Front) The High Bailiff, Ray Holding; The Mayor of Stratford-upon-Avon, Cllr Donna Barker; The Mayor of Whitnash, Cllr. David Clough; Hon Burgess Alec Halliwell; The Low Bailiff, Roger Sutton. Following approval of last year’s minutes, reports were received from Ale-Taster Alistair Price, speaking for himself and for Butter-Weigher Graham Smith, and Brook-Looker Andrew Gardner, speaking on behalf of himself and his fellow Brook- Looker Barry Tulloch. They had “had fun” and these reports were more than slightly tinged with humour but conveyed the officers’ duty of preserving ancient rituals, once taken very seriously for protection of the consumer and care of the environment. The ale and butter on sale, and the River Alne were all declared to be in good health. Mrs Ann Holding, who co-ordinates a heavy programme of educational work at Henley’s Heritage Centre, reported on a busy year there, with attendance figures ten percent up on 2006, defying the general pattern of depressed tourism. The Heritage Centre was founded by the Lord of the Manor’s father, timber billionaire Joseph Hardy, who bought the title at auction in 1990. Many school parties had visited, on programmes related to their curriculum requirements and Mrs Holding said that the Centre was most fortunate to include a number of enthusiastic education professionals among its large volunteer team. 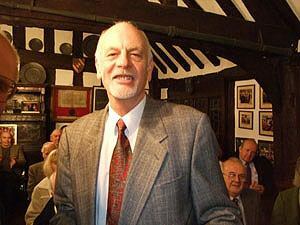 The Town Crier Gordon Trinder reported on his year’s work, which had been non-stop. He had particularly enjoyed the regular task of welcoming visiting school parties coming to Henley to discover its history. He had strained his larynx in sixteen calls on Court Leet Day but had greatly enjoyed his year. His report culminated in a short account of his charity sky-dive earlier in the year, which had raise £1100 for the Shakespeare Hospice. The High Bailiff, Ray Holding, was summoned to report on his year in office. It had, he said, been a lively, stimulating and thoroughly enjoyable year for his wife and himself. He believed and hoped that they had been positive ambassadors for Henley, maintained the Court’s traditions and raised its profile. During the year and earlier, steps had been taken to strengthen the Court’s membership, ensuring a better line of succession for future Low and High Bailiffs: five new members had joined last year, including the Low Bailiff Roger Sutton, who, with his wife Molly, had served the Court beyond the call of duty during the year. Above all, the Court had worked to improve its “connection” with the town, as represented by its many organisations and the High Bailiff felt that good progress had been made. Particular mention was made of the Court Leet Day, in June. This pulled together four of the Court’s traditional re-enactments of ale tasting, butter weighing, brook looking and beating the bounds, together with a miracle play performed by students of the High School with Henley Drama society. He particularly complimented the Hayward, Laurence Marshall and his family for bringing to life the ancient ritual of Beating the Bounds - and on his fine mediaeval attire for the occasion. The High Bailiff thanked the officers of the Court for their commitment and energetic support throughout the year and the Court’s Chaplain, Henley’s Rector Revd. John Ganjavi, thanked the High Bailiff for his year’s work on behalf of the town. Former High Bailiff Douglas Bridgewater gave a report on the restoration project under way in the Guild Hall gardens, announcing a fund-raising supper concert to be held on 22 March 2008, when a Ukranian choir would entertain. Work was proceeding with the long-neglected “riverside” area of the garden, starting with the removal of some lofty and light-obscuring conifers. The High and Low Bailiffs were invested with their chains of office by Honorary Burgess Sharman. The High Bailiff being returned to office thanked the Jurors for their confidence and promised to continue to work for the benefit of Henley during the coming year. 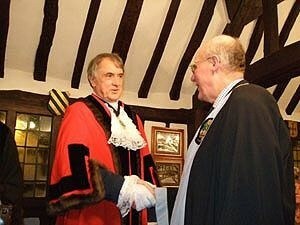 He particularly welcomed the two new members John Rutherford and Stephen Thirlwell. The Town Crier Gordon Trinder was nominated by the Steward and the Chaplain John Ganjavi by the High Bailiff, who invited those present to attend the Court Leet service at St John’s church at 10.00am on Sunday 25th November. At this stage, the two awards made by the Rotary Club were introduced and Rotary president David Snell and past president Alec Halliwell. The awards are reported below in this edition of Henley News On-Line. 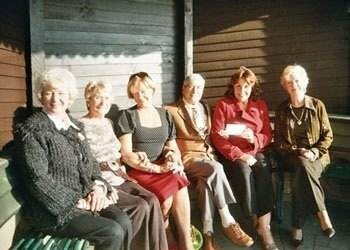 The High Bailiff told the meeting that fifty year ago almost to the day the Guild Hall had been bequeathed to the town by Mrs Olive Nancy Barnard, Lord of the Manor from 1928 to 1974. A plaque commemorating this little-publicised event had been placed in the Hall. The High Bailiff invited Mrs Mary Halliwell to unveil this as a permanent memorial to Mrs Barnard’s gift. ....or to a nearby hostelry, according to inclination. 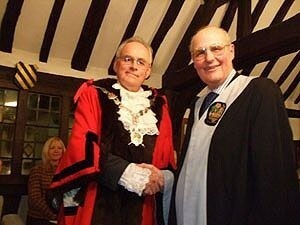 The assembly was closed by the Steward and the Town Crier, who reminded those present to attend “when summoned again”. Many of the distinguished guests present commented how much they had enjoyed the splendid setting of the Guild Hall and the mixture of colourful ceremony, humour and serious business. Youth Club Chairman, Peter Crathorne was awarded the Rotary movement’s highest accolade – A Paul Harris Fellowship - at a presentation at the Court Leet meeting last Wednesday. Named after the founder of the worldwide Rotary Movement, Paul Harris of Chicago, the award has only once been given before outside the Rotary Club in the Club’s 33 years. Peter joins a very distinguished company also honoured by Rotary which includes Bill Gates, Margaret Thatcher, Tony Blair and Nelson Mandela. Making the presentation the President of the Rotary Club of Henley in Arden, David Snell said that although the club knew of his outstanding work as Chair of Governors at Henley High and his work for the Heritage Centre and Heart Start he was being recognised for his efforts to provide interests for the young people of the Town at the Youth Centre and through the Skate Park. 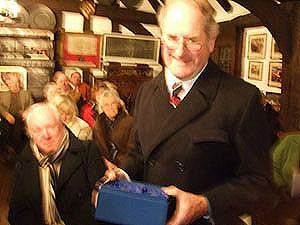 The Rotary Vocational award given for outstanding but quiet work for his community went to Dennis Keyte of Wootton Wawen, not only for his work over a number of years with the local allotment association and the Stratford Beekeepers association, but particularly for his contribution to Wootton Footpaths Group which he founded in 1970 and which continues monthly to provide a source of exercise and interest not only to Wootton but also to the district. The existing Henley team of Paula Marlow, Sarah Smith and Georgia Isom will run the library as usual. There will be a limited service of fiction paperbacks, large print books and younger children’s books but customers will be able to request anything free of charge. Arrangements can be made for sending over special collections for individual readers, for example, talking books. There will be no fax machine and no public computers. The library will be contactable via a mobile number: 07518150006. It is hoped that the existing telephone number (792965) will be automatically diverted to this new number. The library will not be contactable by the Heritage Centre’s own number. Both the Library service and the Trustees of the Heritage Centre are delighted that this arrangement can be made to keep the service alive while the library’s normal “home” is repaired after the flood damage of July. So, you shift the gear stick back into park or neutral, unlock your doors and jump out of your car to remove that paper or whatever it is that is obstructing your view. When you reach the back of your car that is when the carjackers appear out of nowhere, jump into your car and take off!! Your engine was running, you would have left your purse in the car and they practically mow you down as they speed off in your car. BE AWARE OF THIS NEW SCHEME THAT IS NOW BEING USED IN GLASGOW AND MANCHESTER AND IS MAKING ITS WAY ACROSS THE COUNTRY! Just drive away and remove the paper later! It is stuck to your Window and be thankful that you read this email. I hope you will forward this to friends and family especially to women! A purse contains all identification, and you certainly do NOT want someone getting your home address. They already HAVE your keys!!! Last Land and Property Auction of the 2007 Season. 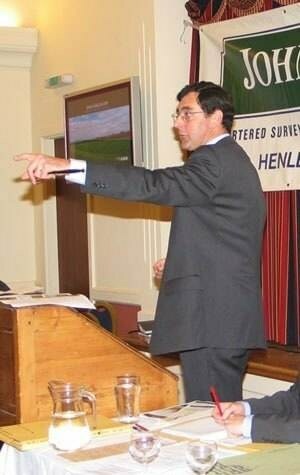 Richard Abbey, Partner and Auctioneer of John Earle & Son, convened the firm’s last land and property auction on Tuesday 13th November at Henley Golf & Country Club, Beaudesert, Henley-in-Arden. Prior to the evening, the firm’s agency staff had concluded binding sales on three of the seven Lots originally listed, these being a substantial house known as Fields End, lying just to north of Henley in Arden, 2 improved cottages owned by the National Trust on the former Coughton Court Estate and 3.5 acres of pastureland & stables just south of Snitterfield. Blounts Hole Farm was not offered, as negotiations were ongoing and a sale has now been concluded, substantially in excess of the guide price. In the room, Mr Abbey firstly offered the ground floor flat in 18 Warwick Road, Stratford-upon-Avon and after a low start at just £100,000 finally brought the gavel down at £200,000. 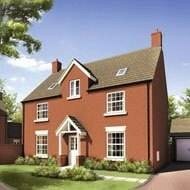 The final Lot to be offered was The Firs, Bradnocks Marsh Lane, lying between Hampton in Arden and Balsall Common. Although the bidding was close to the reserve, a sale was not concluded but negotiations are continuing with interested parties. John Earle & Son’s first land and property auction for 2008, with a number of Lots already penciled in, is provisionally planned for 25th March 2008 to include various parcels of land and properties for improvement and renovation. Housebuilder David Wilson Mercia is supporting Henley in Arden this winter with a donation of £250 to the Christmas lights fund. The money will be put towards the upkeep of the Christmas lights which are managed by the Henley and Beaudesert Christmas Lights Working Party. David Wilson Mercia is currently building a range of one-, two-, three-, four- and five-bedroom executive apartments and houses on a brownfield site at the north end of the High Street behind Millfield Court. The development, which has been named Henley Point, will launch next week (Wednesday 28th November) from Henley Golf Club. The first of the homes will be ready to move into in February 2008. 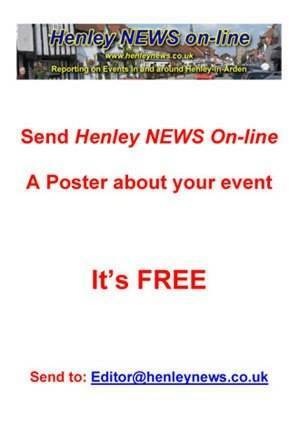 Interest parties are invited to attend the launch at Henley Golf Club from 4pm to 8pm on 28th November. For details call 01676 525 484. Oliver! by Lionel Bart has been chosen because it combines all the art subjects within the school, the show involves singing, acting and dancing with the set being designed by members of the Art department. Auditions began in September and the response was great, all those who attended were given a part which has resulted in the cast crossing all year groups. Rehearsals have been taking place after school and as the performance date draws nearer the schedule has involved some weekend rehearsals too. 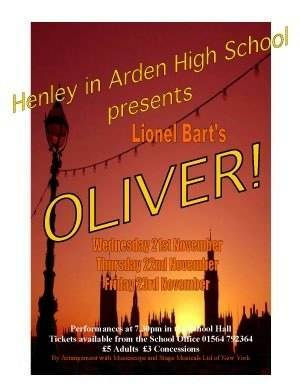 The school has attempted to utilise all its facilities in this production. The lights, set, costume, make-up and sound equipment are used in an attempt to match the standards of a professional production. Performances will take place on three nights: Wednesday 21st November, Thursday 22nd November and Friday 23rd November at 7.30pm in the School Hall. Ticket prices are £5.00 for adults and £3.00 for all concessions. Tickets can be purchased from the school (01564 792364) or, alternatively, on the door subject to availability. So to finish “consider yourself one of us” and have a “fine life” by coming to see us on one of the performance nights, then “be back soon” if you really like the show. 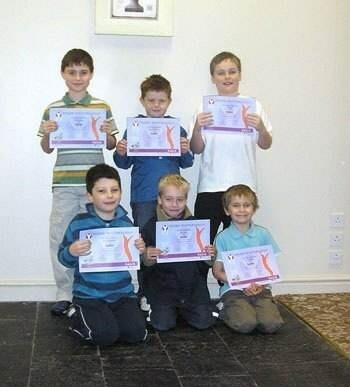 Pictured below are the first graduates from The Haven Pastures Young Masters Golf Academy. Pictured from left to right are Elliot, George R, Joe. Front - George B, Will and Chris. All have successfully passed the 'Cadet Level' of the Young Masters Golf Programme and have now progressed onto the Bronze Level. Young Masters Golf is a structured yet fun way for children to learn the game. Each child receives an informative folder which compliments each aspect of the course and each week they receive not only technical instruction but also information on golf rules and etiquette, this provides a complete grounding in the game. Haven Pastures PGA Head Professional, Neil Evans, said "I have thoroughly enjoyed working with this first group at Haven Pastures, they have all done remarkably well and have really earned their Cadet Level certificate. The YMG programme is a fantastic way for children to learn the game, it’s fun, exciting yet very informative. I look forward to continuing to work with this group of children and to welcoming other groups to YMG at Haven Pastures". One of the parents said, "The first level of YMG has shown Chris the basics of golf, in a fun but structured way, and taken him to a level where he can play the game. He can now competently play 2 or 3 holes of the full course, or the shorter 9 hole par 3 course at Henley Golf Club. It’s a great way of getting him away from the play station for some fresh air and some quality Dads and Lads time. I would recommend the course to everyone with children". Kerry Hant, the activities coordinator at Mockley Manor, has told Henley NEWS On-line about some exciting events at this Ullenhall care home. Two ladies have very special birthdays this month, the first lady is 102 on the 15th and the second lady is 100 on the 30th. Another event is a Christmas Fete on the 8th of December and she is inviting readers to join in at Forde Hall Lane, Ullenhall. If any readers would like to donate anything to their Christmas raffle they would be most grateful. 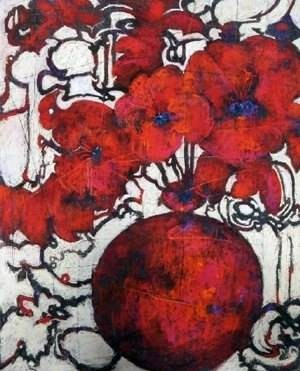 This is a group exhibition of contemporary paintings, ceramics, glass and jewellery by over 45 artists in the Gallery Upstairs and Torquil. The picture right is ‘My Dim Sum’ pastel by Libby January. Torquil has been restored and refurbished after devastation by the floods in July and now has a renewed feeling of ‘gallery space’ with sanded antique floorboards and fresh paint on the walls. Taking part are several artists from Warwickshire and the Midlands including farmer and printmaker, Bill Yardley; painters Joy and Malcolm Wilcox from Stratford (who will be exhibiting recent paintings inspired by painting trips to Spain and Greece), Nigel Fletcher with paintings of Provencal landscapes; Jill Jeffrey with landscapes and still life work and Clive Sheridan with a conceptual and literary approach to collage. We also have Claire Seneviratne and Andy Palin – ceramicists from Warwick and Jayne Lucas, Reg Moon and Carey Moon, resident potters at Torquil. Penny Gildea, one of the jewellers taking part, uses enamel for her beautiful jewellery and lives in Stratford. Established in the Midlands as an important centre for exhibiting British contemporary art and craft, the gallery likes to promote the work of young people ‘setting out’ alongside well established artists and makers. It overlooks a cobbled courtyard which was once an Elizabethan coaching inn and has an ancient yew arch leading to the garden (open in the summer for sculpture and outdoor ceramics). 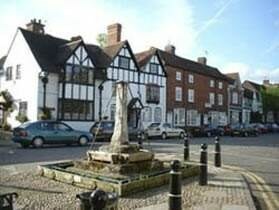 Entrance to the gallery is free, via Torquil on Henley’ tree-lined High Street. An off the cuff comment made by Johnsons Coach & Bus employee, Christine Bridges, resulted in some £500 being raised in just one hour for BBC children in need! Chris, who works in the traffic office controlling the bus fleet threw down the challenge to her immediate colleagues and before she new where she was the idea had been seized upon by the whole company. 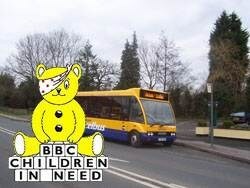 Chris said “I passed a random comment challenging my colleagues to sponsor me for Children in Need if I sang one song. The end result was an impromptu concert in our conference room lasting over an hour. BBC Coventry and Warwickshire turned up and I ended up singing live on the Bob Brolly show. I do like to sing, but I’ve never done anything like this before but everyone seemed to enjoy it. I am delighted with the result and although I was a little apprehensive the end result for this worthwhile charity was well worth a few nerves. Most of my sponsors have agreed to gift aid the money pledged so the £500 raised will increase significantly”. On Tuesday evening last, the Henley-in-Arden Wildlife Socoety were entertained by members John & Penny Stott with their digital photographic talk of their visit to the Galapagos Islands last year. Over 40 attended despite a nasty damp night and thoroughly enjoyed the programme. David Evason,chairman, thanked John and Penny for the excellent evenings entertainment. I had no idea what to expect. Like many, I had seen examples of the exercise on the television but I thought I would look awkward, even silly but no; Debbie, our leader, embued the whole session with the sense that everyone, whatever age, or physical condition could feel a sense of achievement through gentle activity. 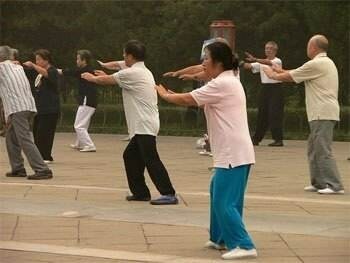 There was no single standard, everyone could move comfortably to the extent of their own ability. Although I was the only man, I was made welcome. Throughout the session quiet and clear explanation was given of each movement, what it was designed to achieve and how the detail of the body positions could ensure effectiveness. Above all, I noticed it developed deeper and more controlled breathing. You know, despite my initial misgivings, I enjoyed the session very much, I will go again and I hope my insight will encourage others to give it a go. Or just come along. 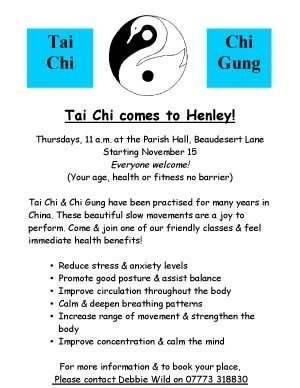 The class meets at the Parish Hall, Beaudesert Lane (parking’s easy) on Thursdays at 11.00am and the session lasts an hour. The cost is £5, but you don’t have to pay per term – just pay when you go. For more details see the poster below. Stratford-on-Avon District Council has once again been successfully enforcing the message that ignoring health and safety procedures in the workplace could land offenders in court following another recent successful prosecution. Haven Pastures was found guilty of being in contravention of section 2 of the Health and Safety at Work Act 1974, that “places a duty on the employers to ensure so far as is reasonably practicable, the health and safety of their employees” at Stratford Magistrates’ Court on 15 November. The golf club in Henley-in-Arden was fined £5,000, and a further sum of £5,000 was awarded to the District Council to cover costs. The local company’s failure to comply with Health and Safety legislation led to one of their employees suffering a fracture, deep lacerations, nerve and tendon damage to his hand while in the process of carrying out maintenance to a piece of green-keeping machinery on which no training had been given. Workplace accidents must be reported to the Incident Contact Centre as soon as possible and no later than 10 days after they have happened. 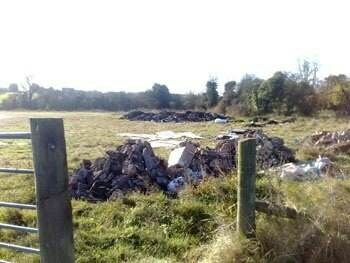 However, the Council’s Public Protection Team at the District Council was not informed until 7 weeks later. Following the investigation of the company, it was found that they were poorly managed in terms of Health and Safety with various contraventions of the law taking place. ATAC - Action Taken Against Cancer recently held a Sunday luncheon event at Charingworth Manor, near Chipping Campden. Frank Vegnuti, president of the Anglo Italian Society based in Rowington generously presented a cheque for £500 to ATAC. Linda Williams, Pat Harrison, Pam Bonati with Frank Vegnuti presenting the cheque to Virginia Haynes accompanied by Shirley Bronwhill. 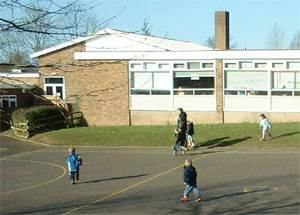 The Reception class at Henley Primary School take part in a Wellie Wednesday session each week. This involves them working outside for part of the morning, usually on the field and the playground. The work they undertake is linked to work they are doing in the classroom. This week the children had a list of objects they needed to find outside that contained holes – see photo right. They then carried out further work when they returned to the classroom, by making observational drawings of things containing holes and writing their own list of holey objects. The same concept is also carried out in Year One but is renamed Fun Friday. Jon Grandfield & Ben Adshead both go for ball. To expect a result against a team top of Division One, having won every game this season other than one was perhaps a little too ambitious. An exciting game and for the first 25 minutes Forest were on top, Knowle perhaps giving us a little too much respect. Gradually Knowle settled down and got to grips with the game, passing the ball well and with pace. Half time, Knowle were 3-0 up as a result of good finishing and a couple of sloppy moments of marking from Forest. Second half Forest came out fired up, looked much better and gave a far better game, restricting the lead from Knowle to just one other goal. At 90 minutes the final score of 4-0 to Knowle does not really reflect the performance on the day, Forest certainly made them work for the result and provided great opposition. Walking the dog across the field at the back of Brook End Drive for the past few weeks has been shorter than normal. But now the travellers have departed, I can walk round the whole field. But to my dismay I found remnants of the unofficial camp site as my photo shows. How can anyone leave such a mess? Everything you would expect from people without respect, bottles, clothes, household waste and as for the toilet paper enough said about that! Who clears up this mess ? the council? Another waste of my council tax. The owners of the field? Where are they. The travellers ? that's a joke. Do the owners care, or will they use it as an excuse to apply for planning permission. If we build houses the travellers can't come back......you can hear the debate now. Does anyone know how we can stop this thing happening? 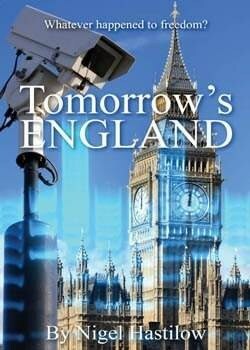 My new book, "Tomorrow's England", is being re-printed to take into account recent events. If you'd like a copy, please e-mail me (nigel@nigelhastilow.co.uk) and I will send you one hot off the press as soon as they're ready(£9.95 plus postage). Whatever happened to freedom of speech? The question keeps cropping up in the hundreds of the e-mails I’ve received in the past few days. Last weekend I resigned as Conservative parliamentary candidate for Halesowen and Rowley Regis after a furore over what I said about immigration on these pages last Friday. My mistake was to invoke the name of Enoch Powell which, despite what I actually wrote, immediately branded me a racist. It also defined the media’s reaction to my article. Yet to the Great British Voter, I struck a chord by saying the unsayable. This is an extraordinary position to be in. All I have done is express in plain English what I believe the vast majority of people now think, which is that we must call a halt to unlimited immigration. Since I resigned, the e-mails have come in thick and fast. There are too many to count and far too many for me to reply to in person. But when you’re under siege it’s very heartening to find you still have friends. A few – very few – have been rude, insulting or gloating. The vast majority are expressions of support and encouragement. They have come not just from the Black Country or Britain but from Italy, Dubai, America, Cyprus, Australia – all over the world. Some tell personal stories about the lives and concerns of the writers. My correspondents say how disappointed they are with Britain today. Some say that is why they have emigrated; others say that is why they are about to emigrate. An ex-colleague I haven’t spoken to for several years is one such. He had been contemplating a move to France. After what’s happened to me, he says he is now definitely going. This is a terrible state of affairs. These people are not right-wing nutters or racist loonies. They are ordinary men and women who are exhausted and exasperated by the way their views are ignored, their opinions are not articulated, their hopes and fears are disregarded. And many of them ask what has happened free speech. Of course we don’t have the freedom to say whatever we wish – various laws limit our ability to say just whatever we want. But there are more insidious ways of curtailing free speech than invoking the full fury of the law. They include intimidation and fear. It is not racist to say this country cannot cope with more and more immigration. Yet the risk of being branded a racist is so great it is career suicide to say so. My own experience makes that obvious. I am no racist. And while the media have not quite branded me one (for fear of the libel laws, I expect) they have come as close as makes no difference. And plenty of web-sites have messages describing me as racist. It is not a pleasant situation to be in. Actually it’s terrible. It is frightening, intimidating and waring to find yourself singled out for vilification for expressing in public views you know full well most people express in private every day of the week. Because this is what happens, we don’t need laws to keep us in line. Fear and intimidation do that for us. That is how political correctness works. Mine is an extreme example. Yet it applies in many areas of our lives. Some of what goes on around us is so patently absurd it makes us scream inwardly. But any public expression of that disgust puts our lives and livelihoods at risk so it’s best to keep schtum. Lie low, put up with it and say nothing. It’s just easier that way. When I was up for selection as a Conservative candidate in Halesowen and Rowley Regis I said I would always express my opinions even if they didn’t accord exactly with party policy. I said I believed in the importance of freedom of speech even within the apparent confines of a political party. I also said – and would still maintain – that one of the reasons why most people are cynical about politics these days is because politicians are seen as slippery, insincere, equivocating and only in it for what they can get. My argument was that a candidate who spoke his mind would be welcomed by the voters as a rare commodity. It is clear that I was right. The e-mails and calls I have had over the past few days have overwhelmingly proved the case. They express real anger that even a political pigmy like me is not allowed to raise one of the most pressing issues of our time without being vilified and hounded out. I failed to appreciate that the constraints on freedom of speech are greater than I feared. They include the deliberate twisting and downright nastiness of the political process itself. There’s also the fact that a political party can’t win if its members are not all rowing in the same direction. But above all the constant self-censorship needed to protect oneself from the wrath of the PC police. That’s why politicians dare not risk saying what they believe. And why I am clearly incapable of being a successful politician. Use a lid when you're cooking with saucepans. Putting the lid on allows you to turn down the heat so you'll also save money with every meal. An added bonus is reduced condensation and dampness in your home. It's good for the environment too because it reduces the amount of climate changing CO2 that is created by cooking. On Monday, the Prime Minister declared the need to achieve more in combating climate change and announced various measures. Our local initiative supports these measures and aims to minimise Henley's contribution to climate change. 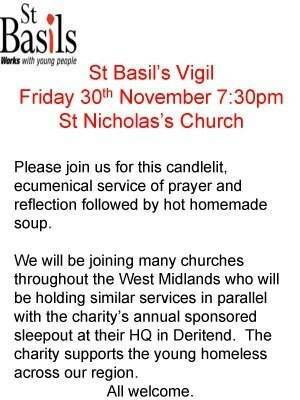 We would be delighted to hear from anyone who wishes to join us and help promote this important activity. Call Margaret 792138 or John 792251. Email users are warned to beware of a bogus 'phishing' email that purports to come from the HSBC bank. The email, entitled 'HSBC Bank UK : Compulsory Security Upgrade' states that the banks security department is 'carrying out a compulsory update on all information on our Internet banking system. You are required to follow the update process' and 'failure to do so will lead to immediate account suspension for security reasons.' The email directs recipients to a link entitled 'SECURE UPDATE PROCESS'. Unfortunately this link is actually to a bogus website. Recipients are advised to delete the email and not to click on the link. Clicking on the link may expose your computer to viruses and malware, and any passwords or other information you provide may be used to steal your money, or for ID theft. Warwickshire County Council Trading Standards Service are warning residents to be on their guard against unexpected telephone calls from someone falsely claiming to be from Warwickshire County Council. Trading Standards Officers have received several complaints from residents who have received such calls. In some cases the caller, after claiming to be phoning from ‘Warwickshire County Council’ or ‘Warwick Council’ for research purposes, has asked the resident how old they are and whether they live alone. Some residents have reported being phoned four or five times. When challenged, or asked which department or service they represent the caller then hangs up. Trading Standards Officers believe the phone calls may be marketing related but advise householders to be cautious and to follow their advice. Saturday 24th November in the Church Hall at 2.00 p.m. Homemade cakes, produce, books, teas, gifts, bric-a-brac, etc. with Father Christmas at 2.30 pm. If you can help run a stall or provide goods to sell, please contact Daphne Jones on 01926 843515. 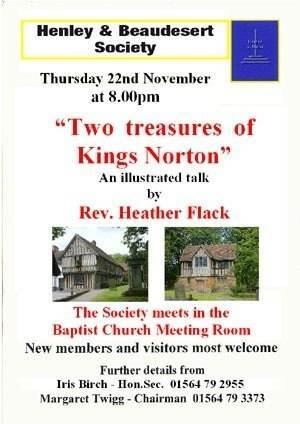 Our next meeting will be on Tuesday 27th November, 7.30 for 8.00 p.m. at Ullenhall Village Hall. 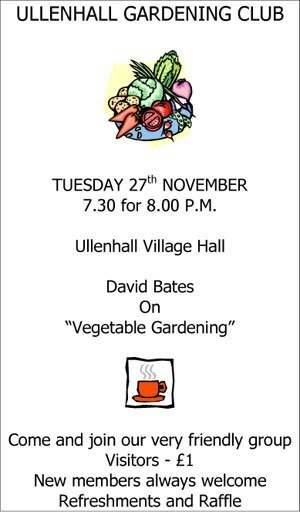 Our speaker is David Bates who will be talking about Vegetable Gardening. Visitors (£1) and new members can look forward to a warm and friendly welcome. Tuesday 4th December – an evening of Miscellany at the Memorial Hall at 7.30 p.m.
11th December - Annual General Meeting and Christmas Dinner at Henley Golf Club at 7.00 p.m.
Tuesday 18th December is our AGM and Christmas Social. 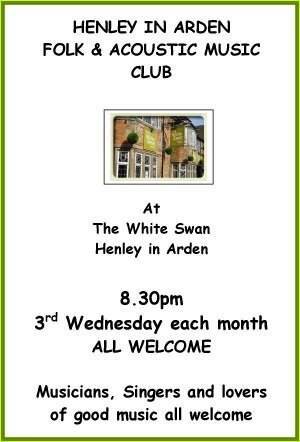 HENLEY AND BEAUDESERT SOCIETY Thursday 13th December 7.30 p.m. (NOT 8.00 p.m.) Christmas Party and entertainment by The Shakespeare Mummers. Tickets - Members £6, Non-Members - £8 includes a light buffet supper and a glass of wine. Contact Iris Birch 792955. 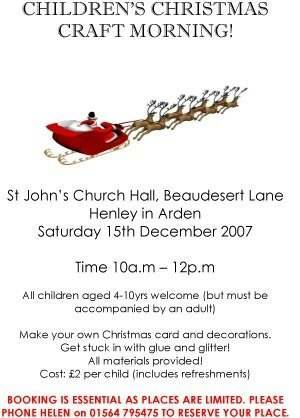 Beaudesert and Henley JPC present “A Christmas Normandy Market” on Saturday 15th December. Plenty of interesting gift ideas and live street music. Rotary Club Charity Collection.